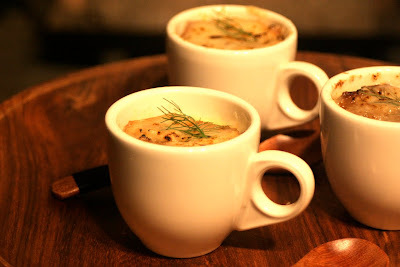 FENNEL 'n ONION SOUP w/Calvados and Melted Gruyere SOUP SHOOTER Fennel is a misunderstood vegetable, I think. A lot of folks think they don't like it because they've heard it has a hint of licorice-like taste and that's enough, it looks like celery and then doesn't taste like celery, or they've eaten it when it was limp and old. If you happen to be one of those peeps, I encourage you to give it another try; at least ROAST it with some olive oil/salt/pepper until it gets a little browned. Almost ANYTHING tastes good caramelized, right? 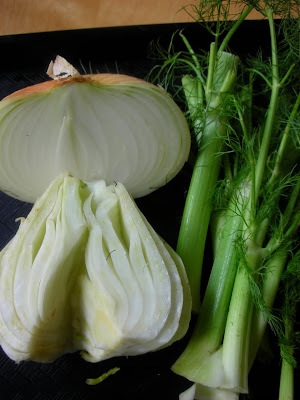 1) Start with a half bulb of fennel, trimmed and cored, a half large onion, a little fresh thyme, and 4 cloves of garlic. 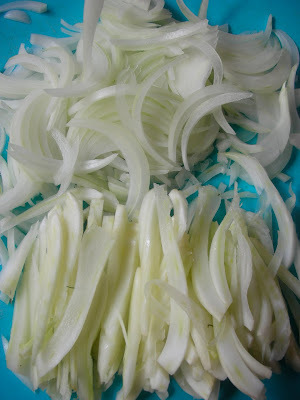 2) Slice the onion and the fennel in long, thin strips. 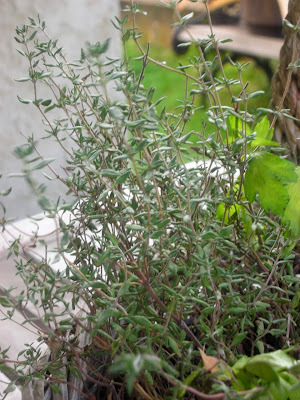 Strip the thyme branch to use the leaves. Mince the garlic. 3) Put the onions, fennel, 1TBL olive oil, 2TBL butter into a large saucepan and sweat (cook on low) slowly for about 20 minutes. 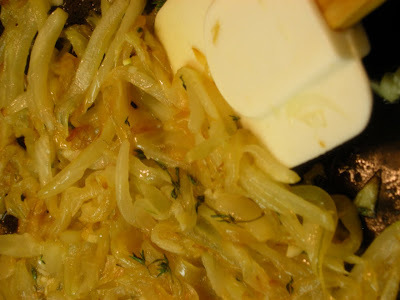 Cook and stir often until the onions and fennel take on a caramelized color. The color builds depth of flavor, so don't rush this part. 4) Deglaze the pan with a shot of Calvados, add the thyme and garlic. Stir while continuing to cook for about 2 minutes. 5) Add the beef stock (or vegetable stock) into the saucepan and cover. Cook on low for about 45 minutes. 6) Toast the French Bread pieces (cut to the size of your serving vessel) on both sides. 7) Ladle soup into bowls (or for a party appetizer into small cups), top with toasted bread, cover in grated cheese and either torch or put under broiler for just a few minutes. This sounds like such a lovely combination of flavors. 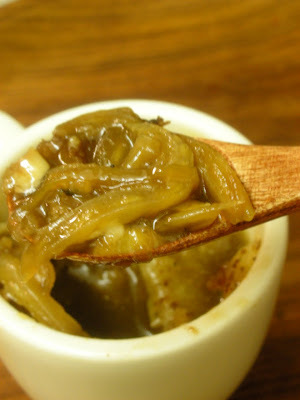 A really upbeat take on French Onion Soup. 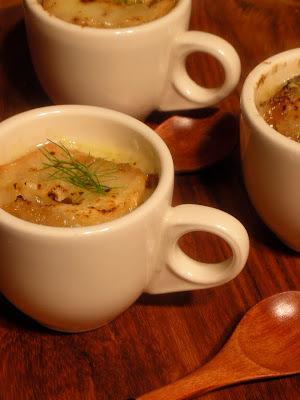 I agree with Claudia - what a fabulous take on French Onion Soup!